Big, Fat Ribbon Share Anyone? This share includes 2 yards each of the following: 1" Double-Stitched Grosgrain Ribbon (Real Red, Chocolate Chip, Bashful Blue, & Rose Red), 1 1/4" Stripped Grosgrain Ribbon (Pumpkin Pie, Chocolate Chip, Old Olive, & Basic Black), and the 3/4" Polka Dot Real Red Grosgrain Ribbon. That's total of 18 yards of Stampin' Up! Ribbon for $18.00, plus Shipping $2.00. 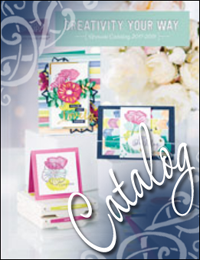 HOW TO ORDER: Email me at connie@constantlystamping.com. Include your name, e-mail address, shipping address, phone number(s) and a detailed summary of your order. I will then send you a Paypal invoice via e-mail. I will order the ribbon for the shares as soon as groups of five are full (you will be added to a group when I receive your Paypal payment). Backorders and shipping time from Stampin' Up! to me are out of my control, but you can rest assured that the cutting, sorting, and mailing will be turned around as efficiently as possible on my end. SHIPPING: I will be using USPS Standard Mail for the Ribbon Shares. U.S. Shipping Only. No shipping cost on local orders if you pick up directly from me.